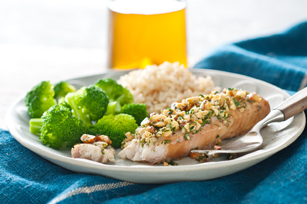 Super-simple prep makes this Roasted Garlic and Nut-Crusted Fish an excellent entrée when you're expecting company for dinner. Pour dressing over fish in shallow dish; turn to coat both sides of each fillet with dressing. Refrigerate 30 min. to marinate. Meanwhile, combine nuts, cilantro, garlic and oil. Heat oven to 375°F. Remove fish from marinade; discard marinade. Place fish on baking sheet sprayed with cooking spray. Top with nut mixture; press lightly into fish to secure. Prepare using KRAFT Lite Balsamic Vinaigrette Dressing. Serve with hot cooked broccoli and rice. Prepare using your favorite mild white fish, such as flounder.